Enjoy an honest-to-goodness Prime Rib dinner in a matter of minutes. 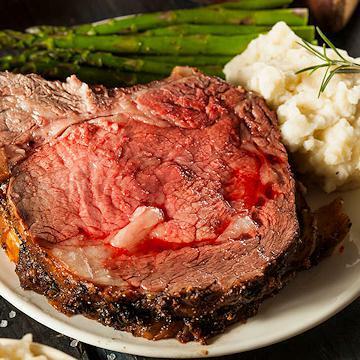 Sliced from a succulent pre-roasted Gourmet Prime Rib Roast, our Prime Rib Slices are the perfect meal when paired with Roasted Garlic Mashed Potatoes, Asparagus Spears With Hollandaise Sauce and Gourmet Horseradish Sauce. Meal serves 4. Thaw in Refrigerator.�Grill: Preheat grill. Brush Ribeyes lightly with olive oil. Grill for approx. 2�-3 minutes each side for a medium rare; 3� minutes each side for a medium; 5-6 minutes each side for well-done.�Oven Broiler: Preheat broiler with pan, positioning top rack 3-4 inches from heat source. Brush Ribeyes lightly with olive oil. Broil for approx. 2� minutes each side for medium rare; 3� minutes each side for medium; 5-6 minutes each side for well-done.�Microwave*: Place vacuum packaged slice on a microwave safe plate. Cut two slits in top of package. Microwave 1 slice for 60-75 seconds on HIGH for medium rare; 75-90 seconds for medium; 2 minutes for well done. Ingredients: Marinated Up To 10% Of A Solution Of: Water, Modified Food Starch (Corn & Tapioca), Corn Syrup Solids, Salt, Sodium Phosphate, Spices, Beef Stock, Flavor Enhancer (Disodium Inosinate & Disodium Guanylate), Yeast Extract, Grill Flavor (Maltodextrin, Salt, Grill Flavor (From Vegetable Oil), Modified Food Starch, Corn Syrup Solids, Smoke Flavoring And Tricalcium Phosphate) And Xanthan Gum. Rubbed With: Salt, Dehydrated Garlic And Onion, Sugar, Spices. Ingredients: Soybean Oil, Water, Corn Syrup, Raspberry Vinegar, Egg Yolks, Modified Food Starch, Horseradish, Salt, Mustard Oil, Potassium Sorbate (a preservative), Xanthan Gum, Calcium Disodium EDTA added to protect flavor. Allergens: Soybean and Egg.